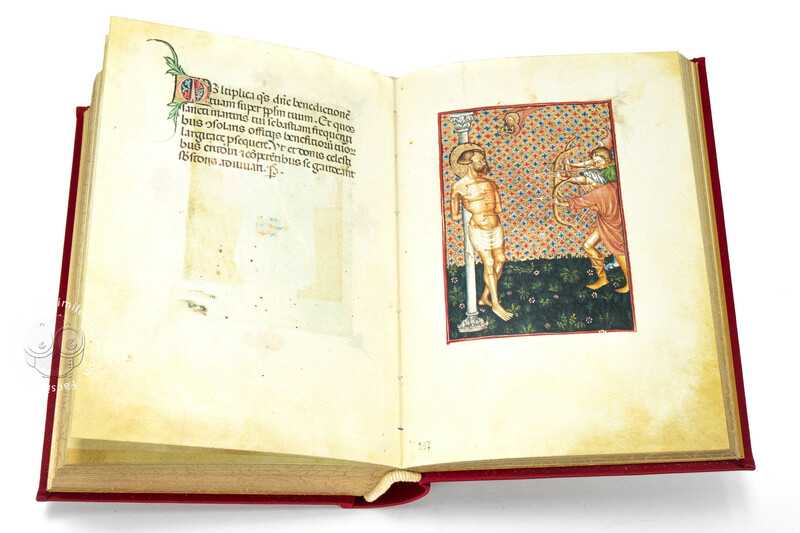 The Officium Virginis of Modena is a Lombard book of hours dated 1390. 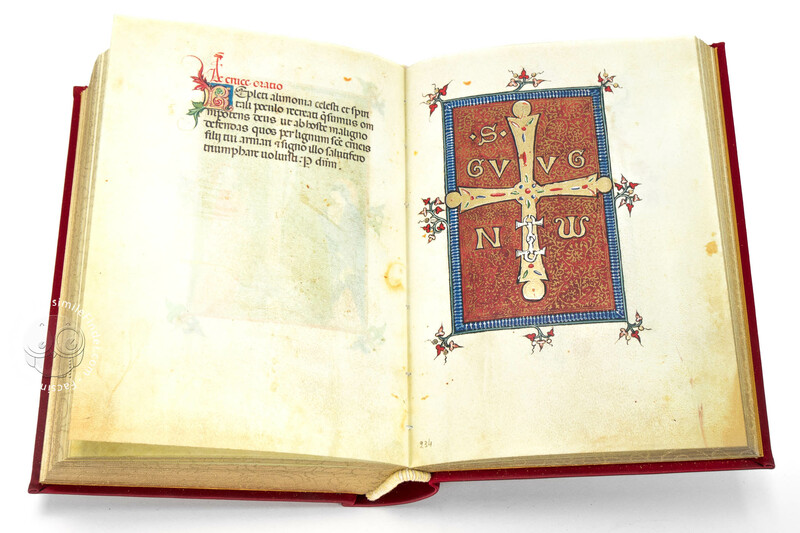 It was written on fine parchment, 15 x 21 cm (5.91 x 8.27 in), and is made up of 272 sheets (i.e. 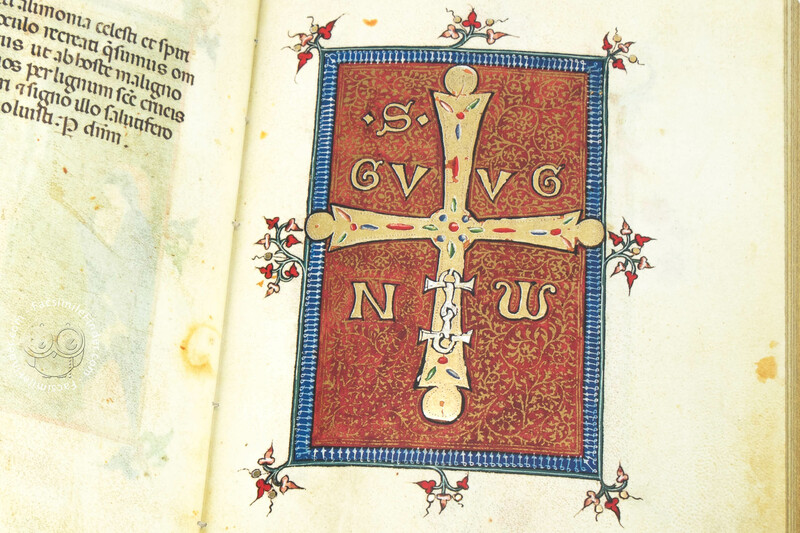 544 pages), of which 28 are full page illuminations picturing saints and religious feasts, and 15 are bordered by vegetation patterned decorations and by illuminated scenes from the life of Jesus and the Virgin Mary. 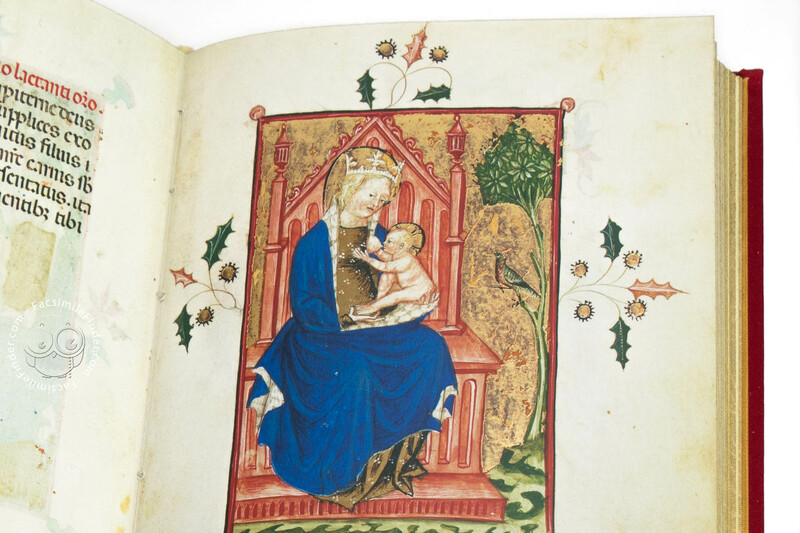 The decoration includes, moreover, some 2500 illuminated initials, of which 1350 are in gold leaf, 532 larger and gilt initials and 300 endpage marks, most of which are also gilded. 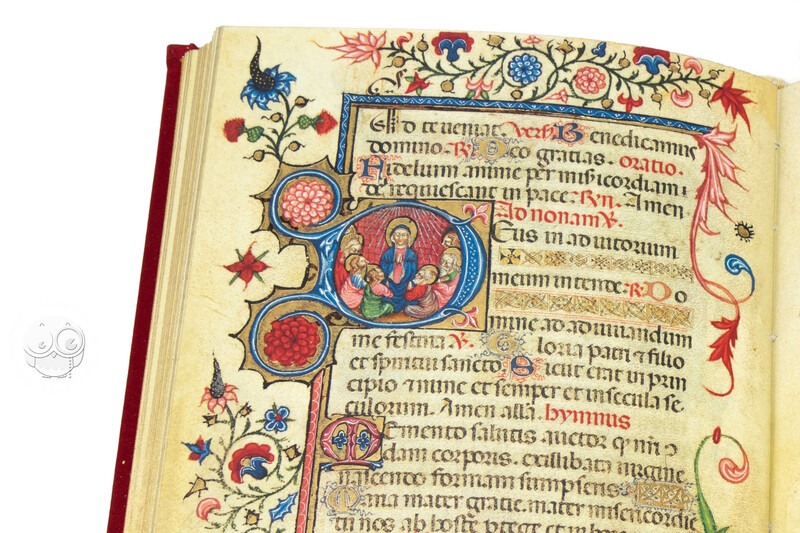 The writing, with indexed headings, is in rotunda Gothic script. 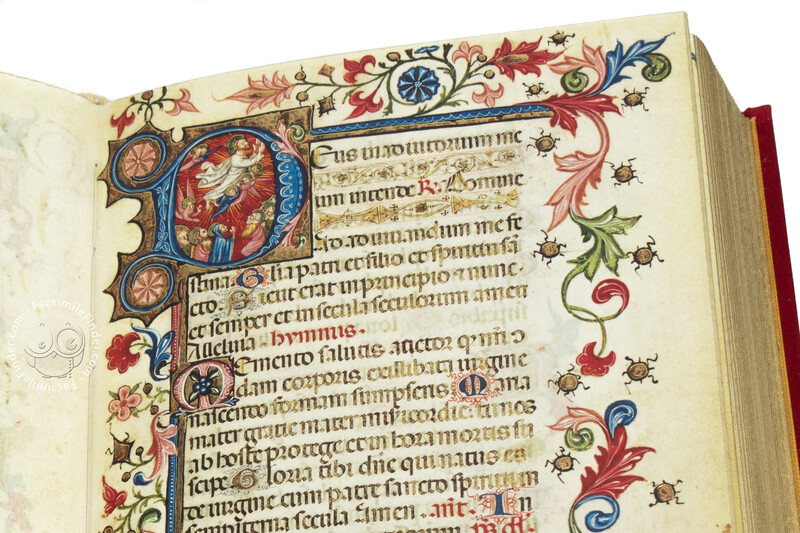 The codex starts with the calendar and continues with the traditional contents of an Officium Beatae Virginis, in compliance with the Roman rite. 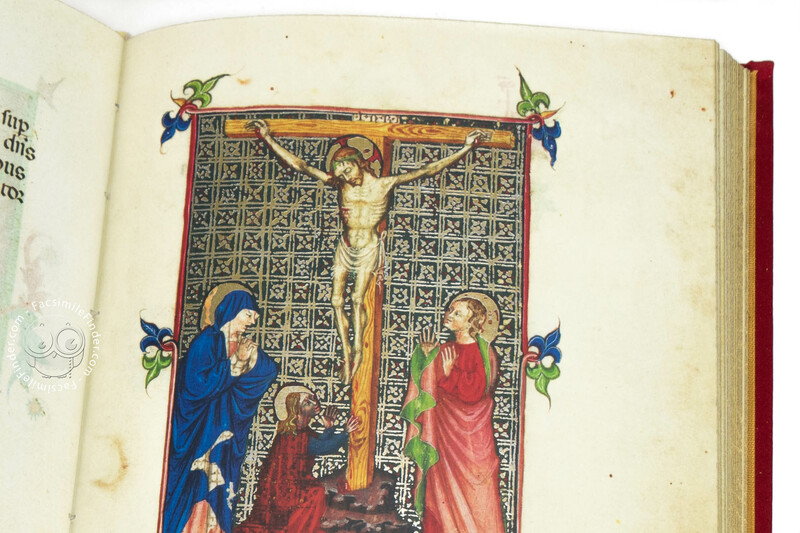 This codex is renowned to be a masterpiece among illuminated manuscripts and is ascribable to the golden age of international Gothic. 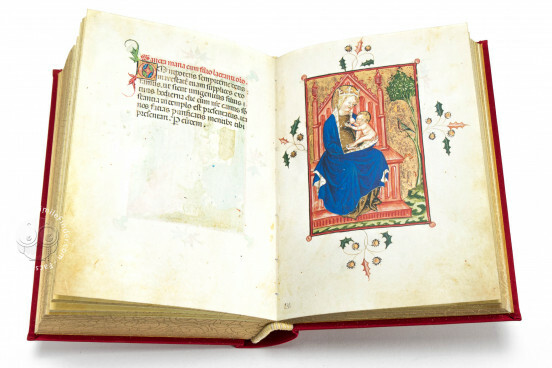 Its illuminations have recently been attributed to Tomasino da Vimercate who worked for the Visconti court and, in the last decade of the 1300s, in the Milan workshop of Giovannino de' Grassi, and who expressed in this Estense Officium the highest levels of his art, always original, surprisingly elegant and particularly gentle in representing the female figures. 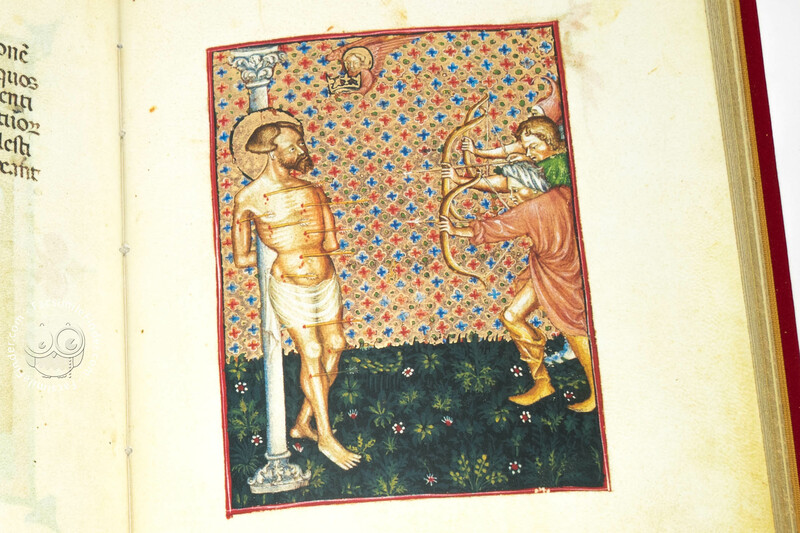 The commissioner was a rich Milanese nobleman, Balzarino de Pusterla – ambassador and courtier of Filippo Maria Visconti – whose coat of arms appears on f. 12r. 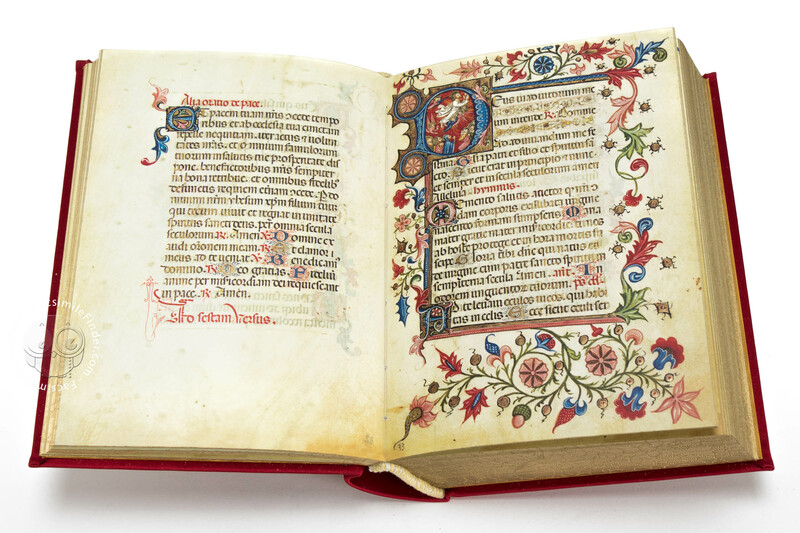 During the 18th century, however, the book became part of the marquis Obizzi del Catajo's refined collection, which was donated to the Estense Library in 1817. 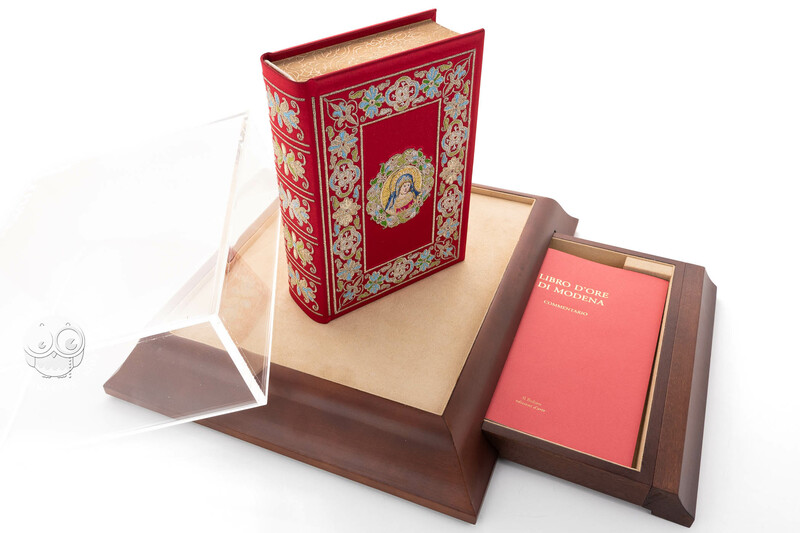 The beautiful and sumptuous red silk binding is embroidered with decorative borders along the spine and on the sides, in gold, silver and coloured silk thread. A framed bust of the Virgin Mary is embroidered in the centre of the front cover, while the coat of arms of the owner is in the centre on the back. 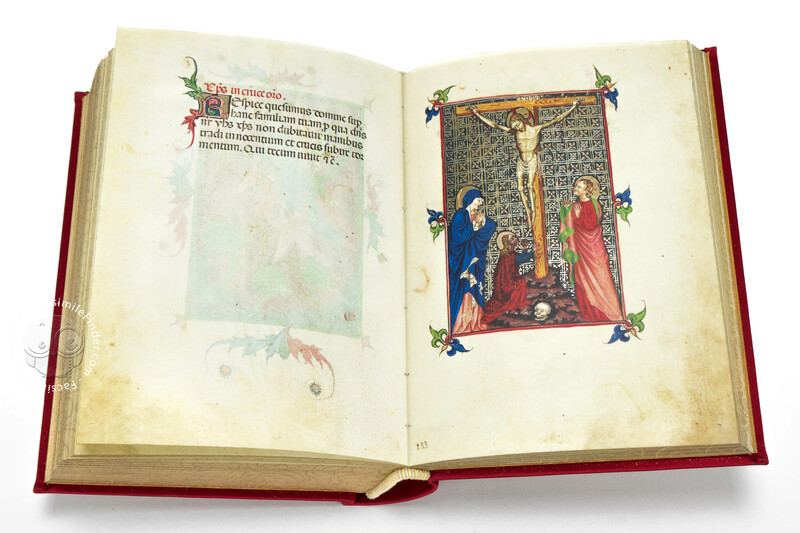 This binding, probably made for an important member of the court in the 16th century, is considered to be a masterpiece for its rareness and magnificence. 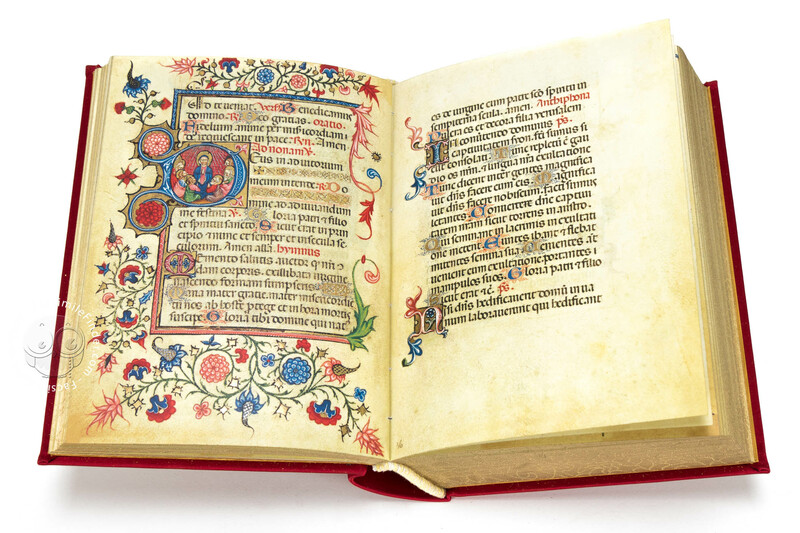 Manuscript book on parchment − 21 × 15 cm − 544 pp. 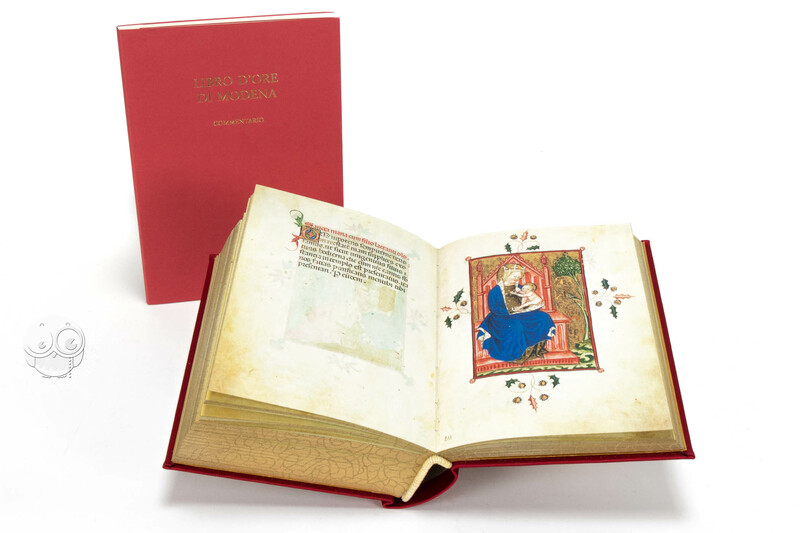 Full-size color reproduction of the entire original document, Master of Modena Hours: the facsimile attempts to replicate the look-and-feel and physical features of the original document; pages are trimmed according to the original format; the binding might not be consistent with the current document binding. The facsimile edition of the Master of Modena Hours was published in partnership with the Biblioteca Estense under licence of the Italian Ministry of Culture. 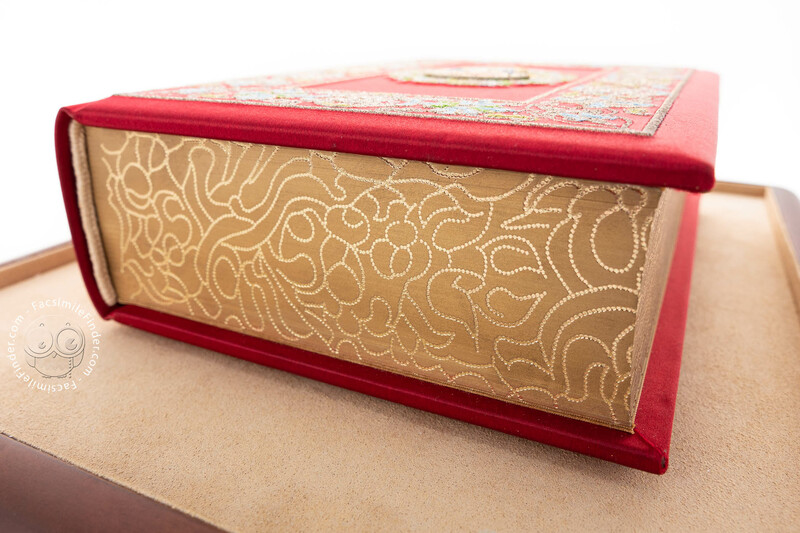 Red silk; embroidery, stitching, and goldsmith cut, manufactured by the hands of skilled craftsmen.